[New for 2012, discontinued] Hey, just because I'm rockin' my son's cold and my wife's fever and muscle aches doesn't mean I don't have time to stop and enjoy a nice ice cream bar... or two.... and then maybe one for breakfast the next day. Yeah, that's right, these little guys are good. Hey, I told you Blue Bunny knows how to rock the freezer treats and these Cadbury bars prove it yet again. There are 4 varieties of the new Cadbury Blue Bunny Bars, each coming in boxes of 8 bars, each being a 2 fluid ounce serving. Being a chocoholic, I couldn't help but grab DOUBLE CHOCOLATE. 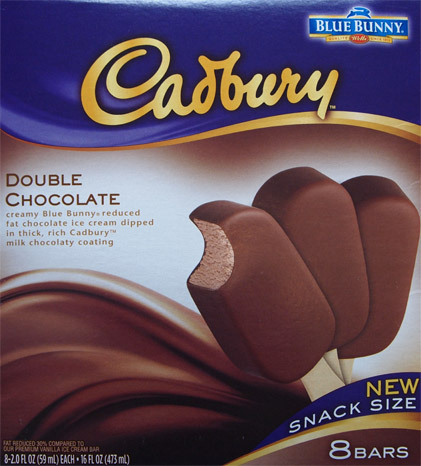 It's creamy Blue Bunny reduced fat chocolate ice cream dipped in thick, rich Cadbury milk chocolaty coating. Whoa, that penny makes it look pretty small doesn't it? Good thing it packs a lot of flavor! They weren't joking about the thick shell! 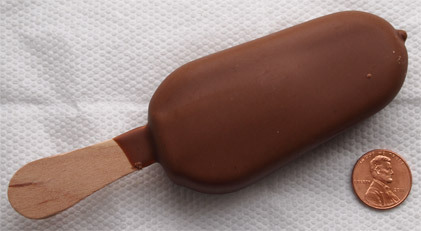 except that (1) double chocolate magnum has the fat of (3) of these. 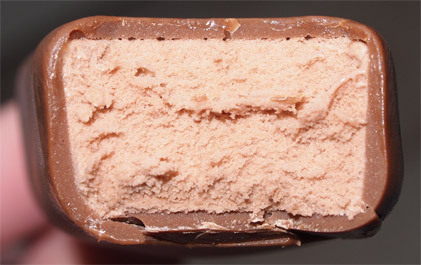 The funnest way I can describe this treat is as a chocolate ice cream filled chocolate Easter Bunny. There's a real nice softness and texture to the chocolate shell if you focus on enjoying that first. Then after a little bit, start taking small bites to really draw out the amusement of this treat. Sure, you can easily devour this one in a few bites (like I did my first one), but that won't satisfy your sweet tooth. You see, my only real complaint on these is the two ounce serving size. I really wish it was three. I base this on the fact that if I eat one, I want more, but if I go with two, I have trouble finishing. There's a lot of milk chocolate flavor coming at you, that's why I say take it slow. If you go for a double serving, you might find that after 3+ ounces, you really start thinking "this was good, but I think I need to stop". Good job Blue Bunny, the team up with Cadbury was a smart move. You could pass this one up thinking it is the same old same old, but it's really not. That Cadbury shell makes a huge difference and I highly recommend you pick up a box next time you see them. Yum! Can't wait to try this one now. I had the caramello ones. They are just lovely but would have been even better with some pecans in there. I'd probably weigh 500 pounds if they did though. These look good! Hope your cold gets better soon! thank you! just got back from Doc, looks like a sinus infection, lucky me! mmmm, I love a quality crunchy shell!